I’m taking a brief NaNo break to write a drabble because I need a little variety and because I had an urge to try my hand at a bit of steampunk. Using my handy-dandy creative inspiration website (see prior post for a link), I found this prompt that I attacked steampunk style. Evelyn stared at the empty glass and frowned. Goblet in one hand and her heavy skirts in the other, she plunged down the dark staircase that led to her mother’s workshop. 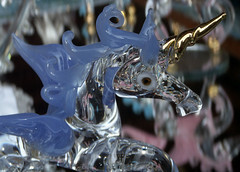 Evelyn stared at the empty glass, that warped and melted into a unicorn figurine, and smiled. Lol, that is terrific. It strikes the right balance between humor and bizarre invention, and the steampunk atmosphere is totally fun. Thank you! I had a lot of fun writing it and predict more steampunk or cyberpunk in my future. I’m so glad you liked it Aimee! Thank you!